This might be a lot of things, one thing is for sure, it ain't pizza, what a god almighty bloody mess, kind of what a Starbucks mint frappuccino is to coffee, the horror. 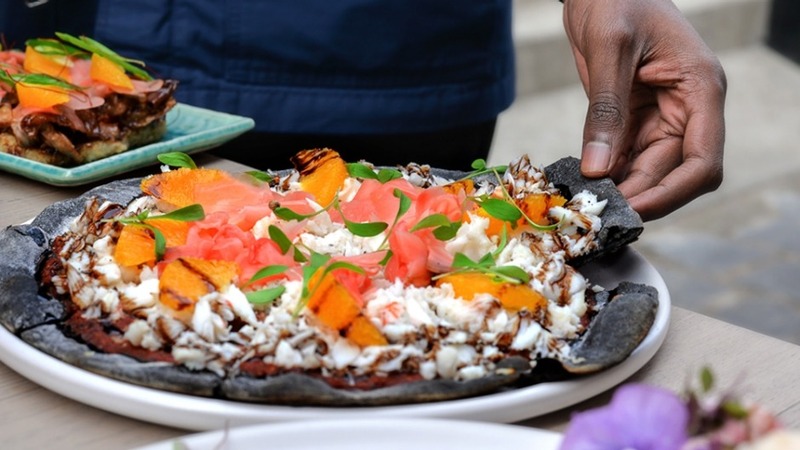 "Sash restaurant has been warming up its act in the Victorian capital in recent months, the start-up turning out rice-based Japanese pizza bases blackened with squid ink. " It's round. It's flat. Has a variety of toppings. I'd let them call it pizza. I'd even try it. It's got to beat Hawaiian. "Pizza is a traditional Italian dish consisting of a yeasted flatbread typically topped with tomato sauce and cheese and baked in an oven. It is commonly topped with a selection of meats, vegetables and condiments." - Wikipedia. My son in law tries the fusion cooking argument on me, yep, progress, bit like filling a baked pie with pumpkin and fish and calling it an Aussie meat pie, it ain't. I reckon a lot of these innovators are frustrated artists, albeit of limited ability. Probably wouldn't be so bad if it were not for the squid ink colouring. I assume rice = rice flour?